SarahB and I love Mame. Period. It’s got a sublime musical theatre score and a fun and funny book with immensely entertaining characters. The show hasn’t been seen in NY since a failed revival in 1983, so we often discuss the necessary ingredients to successfully revive this gem of a musical. The title role is such a difficult star turn, because Mame as a character is rather static – the most that changes in the character over the course of the musical play is her wardrobe (and how); however, Mame is the embodiment of an ideal – a philosophy that life is something to celebrated, experienced and most importantly lived. In order to effectively pull off the musical, you need to find a woman who’s at least in her late thirties. She needs to sing, dance, act – but she also needs to have the presence to execute Mame’s joie d’vivre, while remaining a funny, boozy, lovable, classy, heartfelt, eccentric, bohemian, patrician, progressive madcap. That’s no small order. 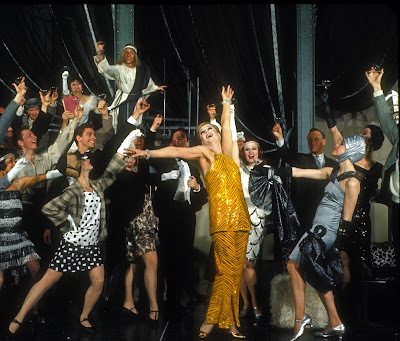 When the musical opened at the Winter Garden, a mere ten years after the overwhelming success of the original play the character of Mame was once again a unanimous audience favorite. Only this time she was supported by the stellar music and lyrics of Jerry Herman, and with a little more heart and less eroticism. Oh -and they gave Vera some of Mame’s more potent zingers (that’s what you do when you cast Bea Arthur). Angela Lansbury became the toast of Broadway, defying expectations and odds to come out the unlikely musical theatre star of the decade. Her Tony-winning, two year run in the original Broadway cast of Mame established her as the leading musical theatre diva of her generation, and held onto the title until 1983, when she turned her attentions to some little old TV show , and well, the rest is history. The original production of Mame, while it didn’t run as long as Hello, Dolly!, followed the earlier show’s example by bringing in major stars to replace the lead. The part was so good, even Judy Garland auditioned for it (which would have been perfect, if not for the difficulties surrounding her drug and alcohol abuse). Janis Paige, Celeste Holm, Jane Morgan and Ann Miller all played the role in NY, while Angela took the show on tour. Ginger Rogers opened the London company. For as good as the ladies were considered in their roles, the part was still closely identified with Lansbury (the 1974 film need not apply). So we were thinking that in order to bring Mame successfully into the 21st century, perhaps it was time to think outside of the box. Not update the show or make it “rock and roll” hour with Tilda Swinton. But just find something new to bring to the show to make it something audiences want to see. Broadway doesn’t manufacture stars the way it once did, so it’s likely that a big name star needs to be attached in order to make a successful commercial venture in NY. (Producers couldn’t even get the 2006 Kennedy Center production with Christine Baranski into town for a limited run). Sarah and I have someone in mind for the show, an unlikely choice but one that we think would work gangbusters, but we’re keeping a lid on that for right now. So instead I’ll put it to you: who is our Mame? “Although our love affair with Mame spans more than a decade, we approached her as the central figure of this musical as if we were meeting the lady for the first time. To spark the musical Mame with a life of her own, we did our best to forget we had written the play Auntie Mame. And a very pleasant miracle happened. Usually the conversion of a straight play into a musical means bleeding off the believability when the trumpets start blowing, and the musical tends to be a cartoon of the play on which it was based. But the opposite seems to have happened here. Many minds have shaped this remarkable lady: Patrick Dennis who created her in his best-selling novel, and now Jerry Herman, who has written a score which underscores the truth and warmth of the people who populate Three Beekman Place. Mame herself seems to have plunged into the joyful work of making this musical. She is an almost unique figure in modern fiction: Mame refuses to be imaginary! She is not a fondly Remembered Mama or a Matchmaker going back to the gaslights of Fourteenth Street. Mame is more interested in torches along the Ganges and the lightning bugs of Peckerwood. She virtually pole-vaults out of the gaiety of the Twenties into lunar orbit, soaring high above depressions, war and worries, taking with her a wide-eyed little boy. We always long for what we don’t have. This seems to be the Year of the Mole – a time of blindness and confusion, of fuzzy aims and fading faith. Our theater lately has been in a dark age, reflecting only shadows. Mame somehow lifts a flame in that blackness. She has optimism! Zest! Bounce! Even when she isn’t quite sure where she’s going. Mame knows, by God, she’ll get there! All of us, even the most despondent and disillusioned, would like to be like Mame. Or we wish she would take us up by the hand, as she does Patrick, and convince us that our planet isn’t such a shabby place. We want to hear her sing “Open a New Window” in a decade when so many of us are pulling down the blinds and locking the shutters in pretended security. Mame is fun, but not mere escapist fare: she sings out a wish to run toward life, not away from it. We have seen Mame’s indomitable spirit embodied in dozens of stars in dozens of countries. Her battles with Babcock and her romance with Beau have been eloquently expressed in the major languages of the earth. But no translation could be more fortunate than the musical language of Jerry Herman. And no one could lift the flame of Mame higher than Miss Angela Lansbury.